The purpose or thought behind this is to provide relief to the orphans in the form of food, clothing, healthcare and education on a monthly basis. It is aimed at those orphans who are living in extreme poverty and have been facing hardships for a long time. They are devoid of the basic needs of life owing to various factors like belonging to families living be-low poverty line, having no regular source of income and having been driven away from their houses due to calamities like cyclone, flood, storm, erosion and ethnic violence. To provide essential needs of the orphans like food, clothing, shelter, healthcare and elementary education. To inculcate self reliance skills in them. To impart health awareness trough the child survival program. To mobilize resources for addressing the challenges, facing the orphans and enable them To realize their hidden potential and power through promoting programs on education, health care, recreational skills, social security with moral supports. 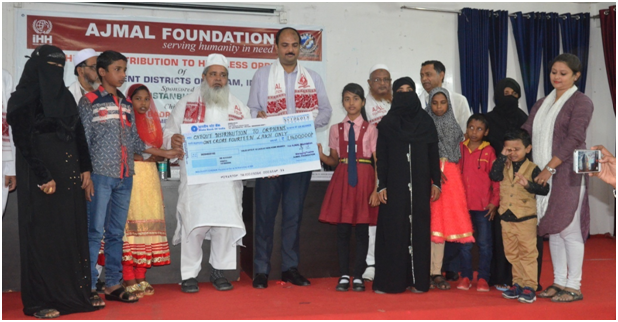 AJMAL FOUNDATION receives applications from needy orphans from across the state of Assam and outside. On confirmation of fund and number of beneficiaries, our organization shortlists the needy children from the data bank present with us, on the basis of beneficiaries’ selection criteria. Thereafter, the beneficiaries are called along with their legal guardian in a suitable place and location and were briefed about the terms and conditions of the project. Thereafter the distribution program is conducted in the presence of the Honorable Trustees of AJMAL FOUNDATION. Orphans living in orphanages and the ones living with their families (day scholar orphans) are the target beneficiaries. Times to time follow up of the progress of the orphans aremonitored by the implementing agency. Orphan Sponsorship Program Coordinators will guide the family of the orphans on how to utilize the funds received. They will also be provided with the knowledge of healthcare, importance of personal hygiene, value of education and a balanced diet. Apart from this, they will be taught about keeping record of things, book keeping and the importance of savings (for future necessities). The coordinators will track each and every individual’s progress of the venture on a regular basis. They will also maintain a record of the beneficiaries’ performance on a monthly basis at least for a period of one year.We will conduct awareness programs on a regular basis with different stakeholder groups; concerning community’s responsibility towards backward sections of the society. The orphans are enrolled in schools or Madrassa attached with the selected orphanage/home or near by location. They receive general education and training on moral & religious issues. Awareness on personal hygiene is organized for the teachers, staffs and orphans as well. The House Tutors keep track of the progress of the orphans within the institutions. It has been planned to run a part time Computer Training Course for the orphans. The meals given to orphans are carefully monitored to ensure its nutrient content, so that they get a balanced diet. Monthly health check-ups on a regular basis are done by a medical practitioner. Treatment and clinical services are arranged for them in times of emergency. To improve the morale of the orphans and to generate enthusiasm for their regular activities, various stimulating events are arranged for orphans. Newspapers, magazines and story books are kept in orphanage library. Visits to places of interest are organized along with conducting of annual sports. AJMAL FOUNDATION has sponsored more than3500 orphans till date and provided them monthly sponsorship in collaboration with different organizations of international repute. We celebrate International Orphan Soliditary Day by organizing picnic trips. The outings are partly recreational and partly educational, with the programs being entertaining in nature. Apart from the outing, we also provide them food package to meet their basic needs.